Nurse Gordon, the daughter of James and Emily Gordon, was born in 1882 at Long Gully in Victoria. She completed her training at the Children's Hospital in Melbourne. It is not known where she worked until just prior to her enlistment on 10 November 1915 when, according to the Tamworth Daily Observer newspaper, she was in charge of the Bush Nursing Service at Ashford, north of Inverell NSW. She served in Egypt at the 1st Australian Stationary Hospital until October 1916 when she was sent to London to work at No 2 Australian Auxiliary Hospital at Southall. This hospital became a specialist hospital to care for amputees and the fitting of artificial limbs. Nurse Gordon returned to Australia in April 1917, re-enlisted and sailed from Melbourne per SS Karoola for Bombay, India via Durban. She was posted to the Victoria War Hospital and promoted to Sister. Nurse Gordon served here until October 1918 when she resigned to be married in the UK. Eventually she and her husband, Robert Ansell, returned to Australia. She died at Wagga Wagga in 1968. 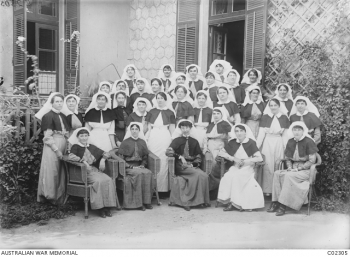 This photo shows the nursing staff of the 1st Australian Stationary Hospital in Egypt about February 1916. Sister Cecil Gordon is in the back row, fourth from the left.